Would the universal basic income (or universal allowance) be the miracle reform that reduces social inequalities and relieves millions of people from the threat of poverty? Both the right and left find things to like about the idea. 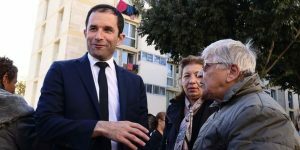 Socialist Party candidate Benoît Hamon made the universal basic income a flagship proposal for his program for the upcoming presidential elections. Manuel Valls (ex-Prime Minister) and Marine Le Pen (extreme right and National Front candidate) are also in favor. Surprising? To better understand what the stakes of this apparently progressive proposal hide, we spoke with Mateo Alaluf, author of the book Universal Basic Income. New Label of Precariousness (Allocation Universelle. Nouveau label de précarité), and co-editor of the anthology Against the Universal Basic Income (Contre l’allocation universelle). Alex Anfruns: According to you, the universal basic income, as presented by Hamon, represents a real alternative for the left? What are its historical origins? Mateo Alaluf: It presents an alternative not for the left but an alternative to the left. First, if one sets aside the idealized mythology that it has retroactively given itself, Thomas More, Charles Fourier, etc., the idea of the universal basic income is more recent and is connected to the emergence of neo-liberal thinking and in particular that of Milton Friedman in the 1960s. However, later critics of neo-liberalism, such as James Tobin, and right-wing and left-wing thinkers, rallied to the idea of an unconditional income. Secondly, the concept of social justice embodied in the universal income is based on the principle that each individual unconditionally receives the same monetary income that he or she is responsible for making use of. The universal basic income is therefore based on the principle of equal opportunity, which characterizes liberal thinking. This idea differs from the principle of equality founded on the redistribution of wealth and the assumption that everyone contributes according to his possibilities and benefits according to his needs. Equality, not equality of opportunity, is, in my opinion, the main marker of the left. This vision of equality has permeated our social protection systems. For example, we pay health insurance based on our income and benefit from it depending on whether we are sick or not. From this point of view Benoît Hamon’s proposal for a universal income corresponds to an abandonment of the principle of equality in favor of that of equal opportunities. AA: In theory we are presented with this idea as being almost miraculous. In reality, has it already been implemented in any other country? If so, what were the results? MA: The idea of a universal allocation has not been implemented anywhere, unless we consider the case of Alaska in the United States, where an oil annuity is granted to the inhabitants of the State. Otherwise, the commonly mentioned “experiments” have been to provide income to poor people in India or Namibia, for example, and find as a result that their situations are improving. Or to observe that unemployed people who receive income without undergoing the controls to which they are usually forced, nevertheless actively seek employment without being incited as far as we know. It is therefore not an unconditional income paid to the poor as well as to the rich. The experimentation of a basic income of €560 per month granted to a population of 2000 unemployed people in Finland is currently very discussed. It has been implemented by a right-wing government made up of three parties, Kesk (center), True Finns (extreme right) and Kok (conservative nationalist), as part of an austerity policy aimed at reducing public spending and containing wages. The main motivation for this initiative is that an unemployed person currently receives a large number of benefits (unemployment, housing, child, etc.) and that a job, in order to reach the level of the unemployment benefits collected by an unemployed person, must correspond to a monthly gross income of €2,300. The goal of granting this basic income is therefore to reduce unemployment spending, to contain wage costs and to reduce the current 9% unemployment. We are far from the promise of a universal income. AA: Within this idea, there could be several options, each with their own political slants: basic income, universal allowance, lifetime wage … With the voter is facing “buyer beware”. How can we make sense of them? MA: There are as many types of universal income as there are people promoting them. They differ mainly by their degree of unconditionality, their amounts, their degree of substitution for social security and their method of financing. Some argue that a left-wing formulation of universal basic income would be characterized mainly by the “sufficient”, that is to say, high income, with the continuation of social security benefits. Yet, the higher the income, the more social benefits would be undermined. For example, in Belgium, Georges-Louis Boucher (MR) proposes a €1000 allowance instead of all other allowances and healthcare insurance limited to major risks only. On the other hand Philippe Defeyt (Green Party) is in favor of €600, which Philippe Van Parijs suggests should be reached in stages to try to preserve Social Security. The paradox thus consists in either advocating a high-cost universal basic income, the feasibility of which implies questioning social security and public services and thereby accepting a considerable social regression; or being satisfied with a modest allocation which could be conciliated in whole or in part with the social protection system. In the latter case, the modest amount of the allowance would require the use of complementary jobs to live or survive, thus condemning the beneficiaries to accept precarious and low-paid jobs. Instead of letting people choose whether or not to be employed and enabling them to devote themselves to a chosen occupation, the beneficiaries of a universal basic income would be reduced to accepting any part time job. Such a system, therefore, constitutes a powerful incentive to accept a job and leads to the institutionalization of precarious employment. AA: In concrete terms, what is the offer proposed by the French candidate for the Socialist Party, Benoît Hamon? MA: The universal income scheme proposed by Benoît Hamon seems very imprecise at the moment. He has proposed many versions and even evoked the idea that his system could be compromised under low income condition and would only concern wages under €2000. It is, in fact, in its formulations an income for young people from 18 to 25 resulting from a merger of social minimums and an expansion of the RSA-base1 to the whole age group. We are actually far from principles that usually constitute unconditional income. Such a system, even if watered down, entails the risk of lower wages and a subsidy to employers. Assuming that a young person receives an allowance of €750 for example, can one assume that his employer will not take it into account to define his salary? The door would in any case be opened in France to the youth SMIC2 that had been up to now fought by the youth and by all the left. One can certainly devise unconditional income formulas that, by departing from the principle of hard unconditionality advocated by its promoters, can be conceived without affecting social protections too much. But when the left subscribes to this perspective, it loses its compass, which is not equality of opportunity but equality, and deserts the battlefield of the conflict between capital and labor. AA: You categorically state that the defense of a universal allowance is tantamount to abandoning the fight against inequalities. Why? MA: By adhering to the principle of a universal income, the left shows its impotence. Under his presidency, François Hollande capitulated before his “enemy, finance”. His government has forced through Parliament the “Macron” law of “growth and enterprise”, which largely subsidizes companies and the “labor law” that progressively guts the labor protections. The universal income then appears like a lure under the appearances of the renewal that conceals its impotence in front of the politics of austerity. It consists of taking a step aside instead of rethinking the social protection system, stemming the under-investment of public services and, above all, concealing the central issue of wages. AA: Yet this notion has the advantage of shifting the focus of political debates from the standpoint of social emancipation, in place and lieu of the strategy of fear and the regression promised by Valls, François Fillon (Right candidate) and Le Pen. Could the application of this measure be considered in addition to other benefits? MA: It is better to discuss universal income rather than exacerbating identity struggles and stigmatizing Muslims like Valls, Fillon and Le Pen. Moreover, this debate has the merit of highlighting the need for a minimum income—different from universal income—which I fully share. It is also possible, insofar as it is modest, to consider it in addition to other social security benefits. But I think we have to be more ambitious. Instead of a derisory amount granted to all, isn’t it better to devote all the resources that could be made available for proper welfare benefits and to restore autonomy to young people by the granting of an allowance to finance their education and higher studies? AA: Faced with the neoliberal offensive still in force on a European scale, and within the framework of the construction of a progressive alternative, what actions are within our reach to move towards a dynamic of social conquests3? MA: On the basis of all the above, it is clear that a new dynamic of social conquest must break with the politics of austerity and focus on wages and the increase of social minimums. The Left, in the tradition of its own, should now imagine the social State in a new globalized context. The elimination of the notion of cohabitant4 in the regulation of unemployment, the individualisation and universalisation of social security schemes must be part of the broadening of social rights. Investment in public services and fairer taxation are also essential elements. However, the main question remains the collective reduction of working time. In a small book written in 1930 and entitled “Letter to Our Little Children,” John Meynard Keynes advocated that full employment should be 15 hours per week. In my opinion, this is the prospect that should mobilize us. Alex Anfruns is a lecturer, journalist and editor-in-chief of independent media outlet Investig’Action in Brussels. In 2007 he helped direct the documentary “Palestina, la verdad asediada. Voces por la paz” (available with Catalan, Spanish, English and Arabic subtitles). Between 2009 and 2014 he made several trips to Egypt and the occupied Palestinian territories. He has edited the monthly Journal de Notre Amérique since 2015. Read other articles by Alex. This article was posted on Monday, March 27th, 2017 at 5:24pm and is filed under Belgium, France, India, Interview, Namibia, Universal Basic Income.